The French Army ordered Athanase de Meziere to Natchitoches, he employed a carpenter to build here a house proper for a gentleman. To this house in 1746, he brought his bride. Built in the 1740s, De Meziere’s house still stands unrecognized, waiting to be part of history, now called the Wells House. De Meziere was the first owner of two arpents on the west-descending bank of the Red River, now the Cane River. In 1747, De Meziere’s young wife and daughter died. The widower moved to larger land holdings. Perhaps these historical facts are hard to accept. The French documents kept in the office of the Clerk of Court are a treasure house of history. It is a kind fortune that the De Meziere document was not stolen during the years of very little care. There have been many owners of this house. The son of Morvant sold it. Owner Joseph Malige prized it, gave it as a gift to his son who scorned the old place. Malige Jr. went into debt to double the size of the house, lost it to Edward Murphy. Murphy signed the papers in July 1808 and died that same week. His widow, Elizabeth Joseph Buard Murphy, bought the house from her husband’s estate. She lived in the house until her death in 1828. Elizabeth’s daughter Eugenie Tauzin bought the house at her mother Elizabeth Murphy’s estate sale. With Eugenie’s purchase began the long ownership by the wealthy Tauzins who suffered greatly during a century of illness, war and misfortune. 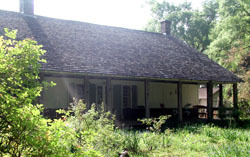 The Tauzin-Wells House is located at 607 Williams St. on the east side of Cane River Lake, within the boundaries of the Natchitoches Historic District. It is a private residence and is not open for tour.